The seaside village of Georgioupolis is located 38 km. southeast of Hania and it has about 500 inhabitants. Although we have no formal proof from archaeological excavations, it is believed that this was the location of ancient Amfimalla, one of the ports of the city of Lappa. The village is named after one of the island Governors, Prince George. Today, Georgioupolis is considered on of most important tourist resorts of Crete, as its exquisite beaches attract great numbers of visitors every summer. From Georgioupolis you will have the chance to visit the Kourna Lake, the only lake on the island, and the nearby village which shares its name. The Kourna Caves were discovered in 1961 at the south side of the lake, presenting a unique site. 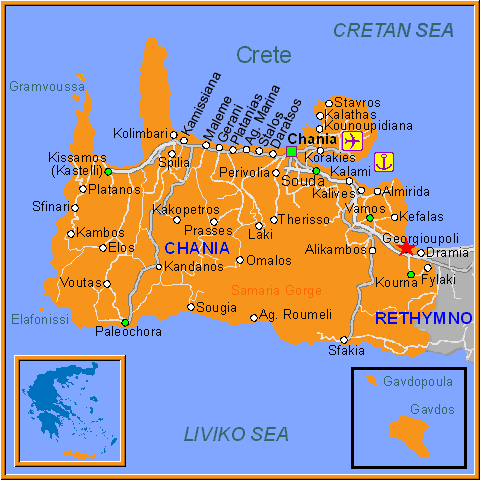 Online Travel guide with the best accommodation in Georgioupolis. Find the cheapest hotels is Georgioupolis & get exclusive online deals. Great rooms at bargain prices. Book online now! Compare Hotel Prices and read Reviews from others. Great Hotel rates and information See photos, reviews & what's nearby Georgioupolis . Detailed tourist and travel information about hotels of Georgioupolis providing also regional information.